Roland Chaney (Daniels) is a bounty hunter in yet another post-apocalyptic world. When his twin brother Oliver (also Daniels) is shot by the nefarious baddie Little Ray (Genesse), Roland goes on a mission of revenge against Little Ray and all his murderous goons. While traversing this dark, dirty, chaotic and treacherous world, he must also protect Christine (Crampton), his late brother’s wife. Naturally Roland has to fight his way through many obstacles before he can get to the final fight. But will he survive that long? Cold Harvest could have been a tough sit, because it’s a DTV Nu-Image product from the late 90’s - not the best pedigree. But it’s actually entertaining and worth watching. 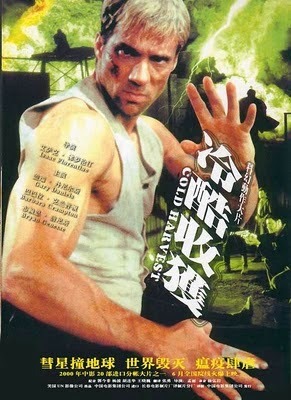 What saves it is the energetic direction by Florentine and the performance (s) by the great Gary Daniels. It also contains some relatively novel ideas, such as the fact that in a post-apocalyptic future it will for some reason resemble the Old West (although this idea was also explored by PM with Steel Frontier). All the stunts, fights, and blow-ups are very exaggerated - to comic book-y, almost childish levels (probably a result of Florentine and his stunt guy’s stints with the Power Rangers) - but still they entertain and have that Hong Kong style to them, such as that thing where an opponent will flip quickly in the air multiple times before they hit the ground. So to recap, Cold Harvest is a sort of melange of B-movie tropes of the day: post-apocalyptic, Martial Arts, and Westerns. It could have been a mess, but thanks to Florentine, Daniels, Crampton and Genesse, it remains watchable. Genesse indeed plays a charismatic baddie, and what all action movies need are a strong hero and a formidable baddie to match him, and Cold Harvest does provide this. And what would an evil baddie be without a sidekick named T-Bone (Caprari)? Of course there are the time-honored guard tower falls/explosions, the Prerequisite Torture of the hero, and the classic final warehouse fight. And it is a really cool fight that makes a nice capper to the film. While some scenes may recall Neon City (1991), among other post-apocalyptic movies that hit video store shelves in the 90’s, none of them had Florentine’s trademarked “whooshing” noises. Whenever someone lifts an item quickly, punches, kicks, or even when the camera moves swiftly (which is fairly often), it sounds like someone is waving a piece of sheet metal in the breeze. Florentine later abandoned this sound effect, presumably because it made things appear too goofy. But this movie is part of the “whooshing” stage of his career. Say what you want about Cold Harvest, but it delivers the action goods. It’s amazing how many so-called “action” movies DON’T deliver the goods - but this one does, and we applaud them for it. This was an OK movie. It suffers from the same thing many action movies made after the mid-90s suffer from: too low a budget. Always good to see Daniels and Genesse, though. The whooshing sound Florentine used was really annoying and I'm happy he abandoned it. Next comment: Whoosh! Yeah, this is definitely one of the better late 90s Nu Image films. Only thing I wish is that Daniels had more of a badass name. Roland Chaney? Really? He should have fought for something stronger like John Matrix or Mason Storm. Also, I miss Isaac Florentine's obsession with wooshing sound effects. It added a layer of humour to his flicks. He should at least give you the option on the DVD to turn them on or off depending on your mood. Roger: The constant whooshing was a bit annoying, haha, but thankfully Gary and Bryan overcame it. Jack: Haha, that's a good idea. We should be able to toggle the whooshing. It's tough to beat Captain Strong. You're right, Roland Chaney isn't a cool name. This was pretty good, Nu Image made some great action in the 90s like Bridge of Dragons, the Operation Delta Force series, Scar City, Sweepers, Top of the World, Redline, Merchant of Death, The Peacekeeper, Danger Zone, Hollow Point, The Immortals, Live Wire: Human Timebomb, Cyborg Cop series, Hard Justice, Beyond Forgiveness, Lethal Ninja, Terminator Woman and the Project Shadowchaser series. Hard Justice rocks! Seen a lot of those movies. Just watched this one and I rather liked it, the ending duel was a particular highlight, although not overly keen on the accelerated footage in the fight scenes. We don't like fast motion fight scenes either. Sometimes they take place in deserts. Haha.